LOS ANGELES -- Warner Bros. studio is teaming up with U.S. producer Jerry Weintraub to bring Edgar Rice Burroughs' Tarzan back to the big screen. Director Guillermo del Toro is currently in negotiations for the new Tarzan flick, the Daily Variety reported Friday. 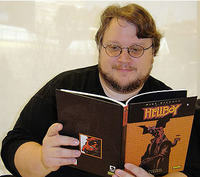 Del Toro (Pan's Labyrinth, Hellboy) grew up reading Spanish-language translations of Burroughs' books and feels that the classic themes are still compelling, the trade paper reported. Del Toro believes that there is new ground to cover in the Tarzan mythology by turning back to the original Burroughs prose. Disney, Pixar's Future Flicks ~ John Carter? April 9, 2008 - Walt Disney Studios and Pixar Animation Studios have announced their animated film schedule through the year 2012. The studios also dropped the bomb that all future Disney and Pixar films, beginning later this year with the release of Bolt, will be presented in Disney Digital 3-D! Notably absent from the announced slate is any hint of Pixar's planned adaptation of Edgar Rice Burroughs' John Carter of Mars. This is probably good news, since it confirms that the planned John Carter film will be mainly live action. The many friends of Wayne and Edie James will be shocked and deeply saddened to learn of Wayne's passing on Friday, April 4th. Wayne was a longtime fan, collector and archivist of the works of Edgar Rice Burroughs. Born John Charles Carter, well after the Edgar Rice Burroughs novel that forever associated "John Carter" with derring-do, Charlton Heston might have been born to play heroic roles -- and at 6' 3", with rugged features and a marvelous physique, he certainly grew up to play them. The Wikipedia biography covers his complex and fascinating life. One year ago Stage Entertainment and Disney Theatrical Productions started with the first try-out of the musical Tarzan, hoping that it would be a great hit. In the US the number of visitors were decreasing at that time. For that reason and the fact that our Fortis Circustheatre had more possibilities, scenes were adjusted and songs were added to be sure of a smashing success. It became a big hit and the audience still love this musical. Within six months the cast album became gold. There are musical lovers who already visited this show for more than ten times! Today with more than 825.000 tickets sold it is the most successful musical in the Dutch history. hurt when they did their own stunts (like Ron Ely). Last week Ron Link broke his hand while he had to run between two tracks and is now at home recovering from this injury. So playing a Tarzan role is not without risk even it is a musical. We wish Ron a speedy recovery as lots of fans are saddened with the fact that they will not see Ron Link as Tarzan. 3 Tarzans: Ron Link, John Vooijs (first Alternate) and Dennis ten Vergert (second alternate). 6 Young Tarzans per group. and all of the other roles played by the great actors. After one year we can say the we have a successful Tarzan musical! Filming begins in August and the call for a cast of a thousand extras will come as early as May 1st, next month. “It will be a real savings for our production budget, in that we are going to ask the natives to just show up in their street clothes,” she added. “That attests to the marvelous job our location scouts have performed.” Early reports suggest the possibility that Utah favorites Dell Schanze or Jimmy Osmond may possibly be considered for the part that was once played by Doug McClure, although no definite decisions have been made. In 2006, Warner Brothers’s “Superman Returns,” with Brandon Routh, earned $200 million at the domestic box office. LOS ANGELES — Time Warner is no longer the sole proprietor of Superman. Joe Shuster and Jerry Siegel sold the rights to Superman in 1938 for $130. A federal judge here on Wednesday ruled that the heirs of Jerome Siegel — who 70 years ago sold the rights to the action hero he created with Joseph Shuster to Detective Comics for $130 — were entitled to claim a share of the United States copyright to the character. The ruling left intact Time Warner’s international rights to the character, which it has long owned through its DC Comics unit. If the ruling survives a Time Warner legal challenge, it may also open the door to a similar reversion of rights to the estate of Mr. Shuster in 2013. That would give heirs of the two creators control over use of their lucrative character until at least 2033 — and perhaps longer. This week’s decision by Stephen G. Larson, a judge in the Federal District Court for the Central District of California, provided long-sought vindication to the wife and daughter of Mr. Siegel, who had bemoaned until his death in 1996 having parted so cheaply with rights to the lucrative hero. The ruling specifically upheld the Siegels’ copyright in the Superman material published in Detective Comics’ Action Comics Vol. 1. The extent to which later iterations of the character are derived from that original was not determined by the judge. In an unusually detailed narrative, the judge’s 72-page order described how Mr. Siegel and Mr. Shuster, as teenagers at Glenville High School in Cleveland, became friends and collaborators on their school newspaper in 1932. They worked together on a short story, “The Reign of the Superman,” in which their famous character first appeared not as hero, but villain. 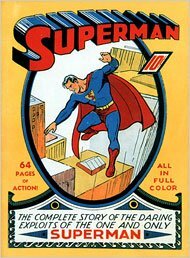 By 1937, the pair were offering publishers comic strips in which the classic Superman elements — cape, logo and Clark Kent alter-ego — were already set. When Detective Comics bought 13 pages of work for its new Action Comics series the next year, the company sent Mr. Siegel a check for $130, and received in return a release from both creators granting the company rights to Superman “to have and hold forever,” the order noted. Mrs. Siegel and Ms. Larson said it was too soon to make future plans for the Superman character. But they were inclined to relish this moment. "Is it hard to produce?" That one got Schumacher right where he lives. Last Friday the second episode of the casting show “Me Tarzan, You Jane” was broadcast on Sat.1 in Germany. The search for the future Tarzan and Jane in the German premiere of Disney’s musical version of its animated hit movie "Tarzan" played to a smaller audience. From a total of 1.54 million viewers (5.0% of the market) the show went down to 1.35 million viewers, equaling only 4.4% market-share. The second episode was the last episode covering the actual auditioning phase. Starting this Friday the "recall"-phase will begin, in which the jury reduces the number of contestants during singing and dancing classes before viewers will be entering the game later-on in live shows. The segements of MTYJ closely resemble those of Pop or American Idol (auditioning, recall/training, live shows with viewer voting). The jury of MTYJ is very competent (a musical manager, an acclaimed musical actress and a casting director) but lacks a character such as Simon Cowell, who is able to entertain the audience with his comments. A "sorry, I don’t see you as Jane" if a clearly overweight participant has turned in one of the worst singing performances of the whole show is just not cutting it. The jury is just too friendly. Episode 49. Tarzan and the Russian Mafia. Antiques Roadshow appraises artwork by Frank Schoonover. Auditions held for a new Tarzan movie. Episode 48. Local sports talk hosts sing about "muckers and grinders." Meanwhile, the Chicago Muckers discuss their favorite minor characters in Burroughs books. LONDON: The National Theater in London has announced the world's longest silent play, running at one hour and 40 minutes, will premier on its Lyttelton Theater stage. "The Hour We Knew Nothing of Each Other," by Austrian playwright Peter Handke, is scheduled for a 30-performance run at the venue, beginning Wednesday, The Daily Telegraph reported Tuesday. "The point is to explore what's left when you remove language -- and the answer is that there's a huge amount," said James Macdonald, the play's director. The play features 27 actors portraying 450 characters -- including Charlie Chaplin, Tarzan and the Biblical Abraham and Moses -- wandering through a city square. The work lacks an overarching plot and contains no dialogue, but the soundtrack includes brief snippets of music, recorded screams and the sounds of airplanes and construction. "It is a great piece of work, challenging and something that we should be doing," a spokeswoman for the National Theater said. "Tickets are selling well -- not like hotcakes, but they are doing well. It is appealing to younger people. We think our more traditional audiences will wait until the review." On January 12 we did a 2-hour phone interview with London journalist Sean Egan for the UK's SFX magazine. The magazine is doing a feature spread on Edgar Rice Burroughs and early SciFi. We are currently scanning the many higher res images that they have requested for print publication. Watch this special issue on the newsstands -- we hope to have reprint rights in ERBzine a few months after the mag's initial release. who turned 90 on January 19. Editor's Note: I have taken photos of the original storyboards that are still preserved in Danton's Tarzana Archives. These will be featured in future ERB Webzines. 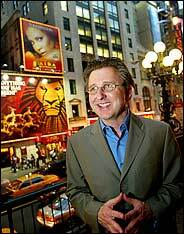 A new production of the Disney musical “Tarzan” will make the rounds of four regional theaters in 2009: Atlanta’s Theater of the Stars in January 2009, followed by stints at American Musical Theater of San Jose, Calif.; North Carolina Theater in Raleigh, N.C.; and Dallas Summer Musicals in Dallas, Texas. The four theatre companies will co-produce with choreographer Lynne Taylor-Corbett. The musical is based on the 1999 Disney pic, “Tarzan” and opened on Broadway in 2006 with a retooled version opening last spring at Circustheatre in the Netherlands where it continues a hit, record-breaking run. 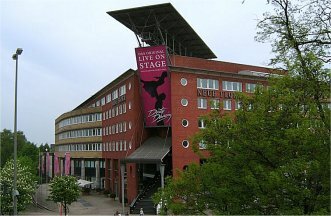 A second international production is scheduled to premiere in Germany at the Neue Flora Theatre in Hamburg in October 2008.Music is by Phil Collins and book by David Henry Hwang. For the new staging of “Tarzan,” the design team includes Kenneth Foy (sets), Ken Billington (lights) and Paul Rubin (aerial designs). The leading actors for the new Disney Musical Tarzan will be cast from January.